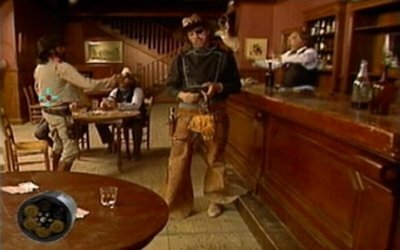 Mad Dog McCree is a Full Motion Video (FMV) game that was originally released in the Arcades in 1990. Your mission is to kill the evil Mad Dog and rescue the mayor and his daughter. To do this, you'll first need to work your way through four stages (Corral, Saloon, Sheriff's Office and Bank), before locating the enemy hideout. The game supports the Peacekeeper Light Gun, but a standard controller can also be used. Although a few scenes are missing from the Arcade original, the video quality is a major upgrade from the Mega CD port (1993). Where things falter is in the gameplay department though, as the hit-box is incredibly small and many times you'll be shot despite pulling the trigger when your cursor is clearly overlapping an enemy. The controls don't fare much better, especially when using the Light Gun, as despite this being an ideal accessory it's laggy and the on-screen cursor doesn't respond to movements quickly enough. Using a standard controller improves things slightly but even then it's not speedy enough to react to enemies before they shoot you. Reloading is activated by clicking an icon in the bottom-left, but the slow controller response times make you wish that an off-screen trigger or button option was available instead. Each level relies on trial-and-error and the only way to beat them is to memorise the exact locations that bad guys will spawn; this takes away from the enjoyment, as you're not solely relying on skill and reactions. As a result of these issues, the action is challenging, but only from a purely artificial point-of-view. You do have the option to save your progress at any point, but the trade-off is having to sit through tedious cut-scenes and repetitive quick draw battles. Mad Dog McCree has aged terribly and you know there's a problem when your main challenges come from locating the miniscule hit-box and then making the controls do what you actually want them to do. It also has a severe lack of content and once you've played through the game there's little reason to return. Random trivia: A sequel called Mad Dog II: The Lost Gold was also released on the Philips CD-i in 1994.